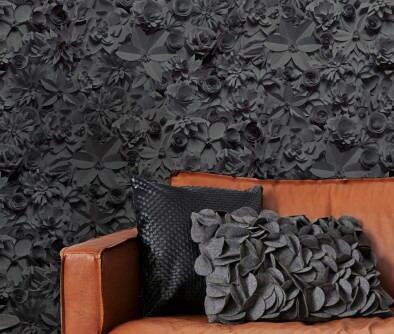 Vinyl wall treatments are a true classic in the world of wallpapers. Like Marmite, you either like them or you hate them! Their practical day-to-day advantages are obvious: they are washable, light-resistant, and extremely durable, which makes them the ideal candidate for frequently used rooms. Vinyl wall décor consists of a backing layer, paper or fibre, and a plastic upper coating (PVC, PU). We offer a large assortment of Vinyl wallpapers, for instance structured vinyl, or vinyl with smooth or embossed surfaces. Their gorgeous exclusive designs and 3D effects will captivate you. Relief structures, three dimensions – vinyl wallpaper is not just pleasing to the eye, but also incredibly tactile and sensuous to the touch. Silky, shiny surfaces provide these wall treatments with stunning elegance - and you with a sheer endless array of possible uses in terms of interior design! Strong and bright colours, innovative patterns and designs, and breath-taking attention to detail guarantee that our new vinyl range is an instant classic, perfectly suited for wet rooms and frequently used areas. Our vinyl collections meet the highest demands of classic as well as modern tastes. Vinyl is the stuff that wall art dreams are made off. 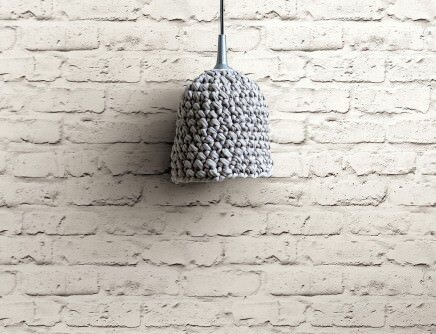 These wall treatments are almost indestructible and incredibly robust. The fact that they can simply be wiped down is an absolute bonus. This true star amongst wallpapers attracts the eye with three-dimensional structures and creates the temptation to touch it again and again, to explore it with one’s fingers. Exquisite shine and lustre characterises our smooth vinyl wallpapers, whilst the patterned models provides a charming retro feel. Opulent or subtle, edgy or romantic: Vinyl works in any environment. 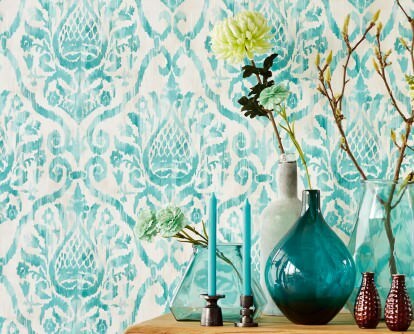 Vinyl wallpapers were an absolute hit when they were first introduced to the market - and that hasn’t changed. Their popularity is set to continue into the future. 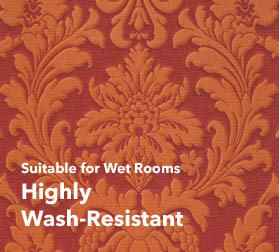 The pattern designs of these washable synthetic wallpapers are extremely versatile. This unusual wall décor provides a plethora of advantages and can be used in a whole array of environments. 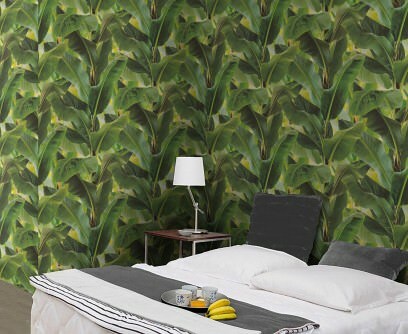 PVC wallpapers are extremely suitable for rooms that are subject to high levels of humidity, e.g. kitchens and bathrooms. But they are also ideal for ‘heavy use’ areas like hallways, staircases or children’s rooms. Vinyl wallpapers can even be used in (dry) basements. In commercial, business or public areas, striking Vinyl wallpapers have replaced the glass fibre wallpapers that were omnipresent before. They prove that colour, vitality, stunning patterns and durability as well as superior cleaning characteristics are not mutually exclusive. Discover the wonderful world of vinyl wallpapers, which has developed in all sorts of unexpected directions within the last few decades. Striking material imitations like stone, wood, tiles and leather create a stunningly realistic ambience and introduce structure into a room. A huge number of designer wallpapers with high-quality synthetic surfaces and patterned wallpapers which wow our customers due to their three-dimensional beauty can be found in our exclusive Wallpaper Shop. Today, original vinyl wallpapers from the 70s – with their bright, sometimes even garish colours and cult-status vintage patterns – are a highly sought-after rarity coveted by many collectors. 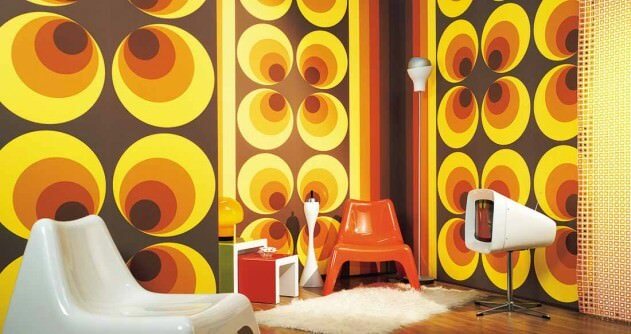 Is it any wonder then, that vinyl wall décor began its journey to lasting success in the ‘Flower Power’ era? After all, 70s design introduced plastic and synthetic materials like no other decade in history. Customers soon discovered the practical aspects of synthetic wall treatments and enthusiastically used them in their homes, because they opened hitherto unknown possibilities: bathroom, kitchen and hallways were now transformed into groovy design areas by using washable and robust synthetic wallpapers. Vinyl wallpapers in a tile design or attractive stone or wood imitation varieties became very popular in the 80s and provided even more design opportunities. Plastic-coated wallpapers were easy-care and washable, which made them an obvious solution for areas that were prone to humidity or dirt. 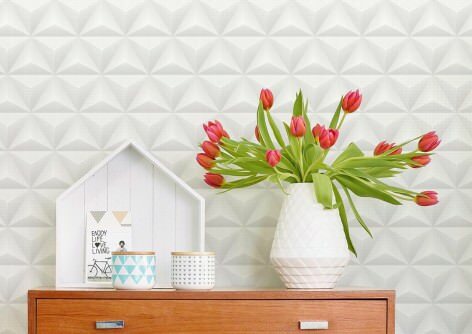 Decades have passed, but vinyl wallpaper is here to stay. Continuous developments in terms of new designs and pattern ideas are still increasing the popularity of this timeless classic amongst wallpapers. Washability characteristics from wash-resistant to scrub-resistant are just part of the quality features of wallpapers with plastic coating. Vinyl wall décor will continue to enjoy this popularity as an attractive way to treat walls that are more at risk of becoming damp or dirty. Just like every other wallpaper, the Vinyl variety has a carrier layer. This can be made of recycled paper or a combination of cellulose and textile fibres. The carrier material determines the differentiation between paper-based vinyl wallpapers and non-woven (or fleece) vinyl wallpapers. Visually and structurally, both variations provide almost unlimited design options. 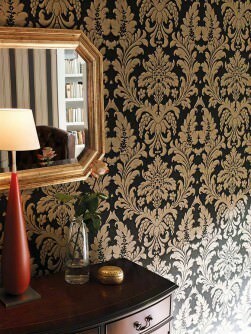 The decision as to which vinyl-type wallpaper variety to choose depends entirely on practical wallpapering preferences. 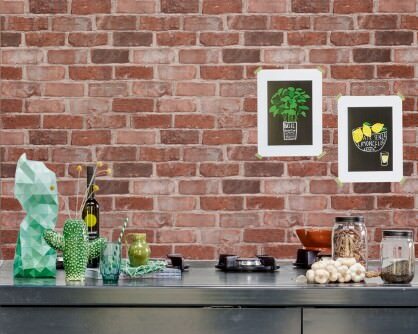 With paper-based vinyl wallpapers, the adhesive (paste) is applied to each strip and it must then be left to soak in. With non-woven-based vinyl wallpapers, the adhesive is applied directly to the wall and no soaking time is required. The wallpaper can be put up on the wall as soon as it has been cut to the correct length. In addition, fleece wallpapers can be removed very easily, as entire strips come off the wall without leaving any traces behind and without the need to soak them first. Paper-based wallpapers are available with the following characteristics: "Remove after soaking" or "Remove in a dry state". Non-woven wallpapers have further functional features: they retain their shape, regulate moisture and correct minor unevenness. In combination with the PVC coating, the moisture-regulating feature is less relevant as the sealed vinyl surface will not let any moisture through anyway. Whatever the carrier material - the vinyl coating is, by its very nature, moisture-repellent. The synthetic surface of vinyl wall décor comes in many varieties, e.g. smooth, structured, or embossed. The surface material of Vinyl Wallpaper is Polyvinyl chloride, PVC. In common parlance, the terms vinyl wallpaper, PVC wallpaper and synthetic wallpaper are often used synonymously. However, there are some technical differences. Synthetics can be divided into three main groups: Thermo plastics, duro plastics (or thermosets), and elastomers. Polyvinyl chloride is a thermoplastic substance derived from vinyl chloride. It belongs to the group of thermoplastic resins (along with polyethylene and polypropylene). In addition to PVC, the surfaces of synthetic wallpapers can be made from other substances from the main group, e.g. polymethyl methacrylate, polyvinyl fluoride or ethylen-vinylacetate copolymer. The vinyl surfaces of Designer Wallpapers can be smooth or come in various degrees of structure and tactile relief. Consequently, there are different methods of coating with PVC. The carrier layer can be laminated (coated with a thin plastic film), which is then printed on or embossed. Another method is applying a pre-printed PVC layer and subsequent hot embossing. So-called foam wallpapers are also known as vinyl wallpapers. This is when the carrier material is treated with PVC foam to create a multi-dimensional pattern structure. 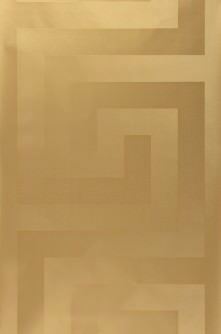 Besides vinyl foam wallpapers,embossed vinyl wallpapers also provide a tangible relief. Both variations of vinyl relief wallpapers are generically referred to as vinyl structure wallpapers. 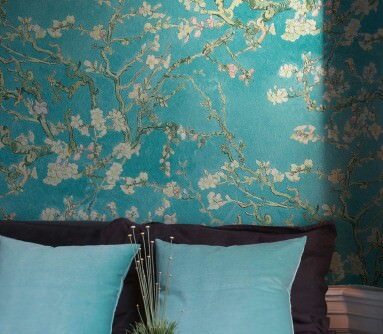 In our Wallpaper Shop, you will find Smooth Vinyl Wallpapers and Structured Vinyl Wallpapers in any number of variations: silky smooth or multi-dimensional and tactile with depth effect. In terms of fabulous, elegant, extravagant, exceptional cult patterns, our Vinyl Wallpapers cater for any imaginable requirement. 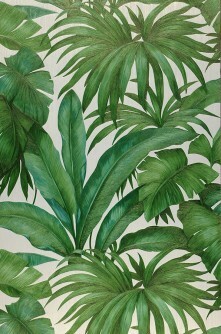 Every conceivable pattern and motif can manifest on Vinyl Wallpaper: Baroque patterns, floral patterns, geometric patterns, stripe or polka-dot patterns, imitation wood or stone, tile designs, leather look, beautiful scenery and landscape motifs, comic heroes, cult figures, people, animals, objects, abstract, authentic or imaginative depictions. This versatility makes wallpaper "vinyl" so flexible and suitable for a whole range of interior design themes and styles. Coupled with an intoxicating choice of colours, these fantastic decorative elements enable you to realise even the most outlandish design concepts. Gloss and matt effects create a feel of spatial depth and plasticity. Who'd have though it? The surface of our Leather Wallpapers is treated with vinyl, and special embossing methods and structure profiles make them look incredibly realistic. Why not introduce the special flair that leather wall décor provides into your own home and create an extraordinary ambience? At the same time, you will benefit from many positive features like washability, light-resistance and durability. Leather Look Vinyl Wallpapers come in a huge array of colours - from the natural hues of real leather to metal effects or expressive neon colours. Each leather wallpaper in our range has its unique style, with individual structures exuding a sense of dynamics and luxury. 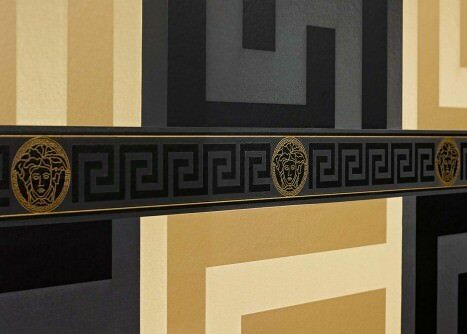 Amongst the many fantastic designer wallpapers with vinyl surfaces in our Wallpaper Shop, you will find a range by premium luxury label Versace. These artistic, luxurious and sophisticated patterned wallpapers are treated with a durable and washable vinyl surface layer. They're quite simply haute couture for the wall and a revelation in terms of maintenance, versatility and lasting beauty. Like wash-resistant varieties, but even major or fatty stains can be removed. However, scouring agents must not be used. For vinyl wallpapers of this category, a sponge or soft brush and mild scouring agents can be used for cleaning. Like scrub-resistant, but more durable and scrubbable. Note: Foam wallpapers should only be cleaned with a sponge or damp cloth as brushes can damage the foam layer. Never apply too much pressure on the surface when cleaning. Depending on the carrier material, you should refer to our wallpapering instructions How to hang non-woven wallpaper or How to hang paper-based wallpaper , respectively. The information label provided in each roll of wallpaper includes instructions as to which wallpapering paste or adhesive to use. Depending on the thickness of the wallpaper and the type and structure of the underground surface, dispersion adhesive or a mixture of paste/special paste and dispersion adhesive might be required. Generally speaking, the surface needs to be clean, dry and absorbent to achieve the desired results. Minor cracks or irregularities can be evened out with smooth or structured vinyl wallpaper. For wet rooms like bathrooms or kitchens, we recommend non-woven or fleece vinyl wall décor. 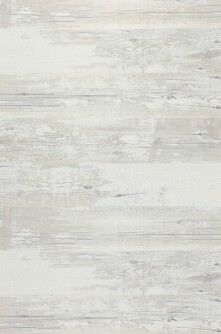 Vinyl wallpaper is also suitable for basement areas, e.g. party rooms, as long as the walls are dry and mould-free. These rooms should always be well ventilated so that any moisture can escape through open windows or dry off.